beautycouture.xox has no other items for sale. Details about Hard Candy Nail Polish Color YOU PICK / CHOOSE SHADE(S) Buy 2 get 1 FREE new! Hard Candy Nail Polish Color YOU PICK / CHOOSE SHADE(S) Buy 2 get 1 FREE new! ESSIE TREAT LOVE & COLOR Nail Strengthener Treatment Tinted Polish U PICK SHADE! 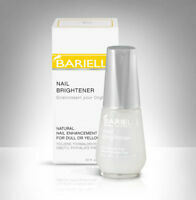 Barielle Nail Brightener .5 oz. Barielle Instant Liquid Nail Hardener .5 oz. Sales tax may apply when shipping to: IA*, MN*, NY (8.76%), WA*. Wonderful item received,fast shipping & good packaging too! 5 ☆☆☆☆☆ EBay Seller! no longer sold in stores and one of my favorites so happy I found this one! didn't realize these were glitter lol but love the base color! Great color & quality polish. thank you.